I love reward points. I collect PC (President’s Choice) points, Shopper’s Drug Mart Optimum Points and Airmiles. Recently even Sobey’s started offering points and I got one of their cards too! Shopper’s Drug Mart makes very little off of me, so much so that I’ve begun to question the ethics of points. Just last Saturday, on double point redemption day I cashed in 40,000 Optimum points for $100 worth of free stuff. My trick? I read the flyers, only buy what’s on sale at a lower price then I could get it anywhere else, buy what’s on my list and only shop there on double point days. Then I cash in my points on double point redemption days. Just this morning I picked up a brand new ‘pay as you go’ PC Mobile LG Rumour cell phone. They were offering $10 off in groceries when purchasing a new phone. My old 2004 model had a dying battery and I’d been looking at them for a while. I ‘paid’ for the phone with PC points and picked up a large can of coffee and some OJ for all for ‘free’! It didn’t cost me a thing. I use a PC Mastercard for all of my monthly purchases and pay it off every month. Our expenses aren’t huge but it adds up quickly over time. I also have a free subscription to MoneySense magazine and to Chatalaine which I received by redeeming Airmiles. Airmiles has all sorts of things to redeem with points including cameras, ipods, movies, gaming systems, passes to museums and more. I didn’t find the HBC (Hudson’s Bay / Zellers) points very lucrative but found that I could automatically transfer HBC points to Airmiles. I pay for my purchases with my PC Mastercard but show my Airmiles card wherever it’s accepted. I also shop through Airmiles stores. With a student in the house we are regularly purchasing pricey textbooks through amazon or chapters. If I shop through Airmiles store, it’s the same price but I get extra points. Lately I’ve started to wonder, if I’ve been saving thousands of dollars over time by using reward points, who is paying for what I’m getting? Someone must be! My guess is it’s the guy who pays full price for the can of $4.99 shaving cream, the same brand which is available in the grocery store for $2.75 and at Walmart for $1.99. Perhaps it’s the company itself that takes a risk that I’d buy more when they offer points on products. Is it ethical to use points to my advantage knowing that in some cases a company is losing money on me? I’ve never paid a late fee on my Mastercard and never paid a cent of interest. I don’t have any balance protection insurance or identity theft insurance. They don’t charge a yearly fee. Yet I’ve managed to redeem over $1629 in free groceries and other items including a new cell phone just through my PC Points alone. Studies have been done that show that people are motivated to spend more when points are offered. It’s why companies offer them. Yet if I’m careful to buy only what’s on sale and only what’s on my list; if I play by my rules instead of theirs and save money in the process, is it still ethical? I’m not breaking any rules but I do wonder who is subsidizing my new cell phone, my thousands of dollars in free groceries, my hundreds of dollars of savings at Shopper’s and my future ipod touch thanks to Airmiles. Editors Note: In my opinion, if you like to travel, the highest yield (no fee) rewards credit card in Canada is the MBNA SPG Mastercard. Who’s paying? You are! So is everyone else that shops at the store. It’s factored in to the pricing of items at the stores that offer the points programs. I think you are a smart shopper who has learned to use credit points to her benefit. I don’t think there is anything wrong with that…more power to you! Kathryn, it’s up to the stores to decide how much they want to pay for your private info and the possibility of a profit off your purchases. Is it still ethical? Absolutely. It works both ways. Is it ethical that I should have to pay $X per year for garbage colleciton, even though I produce about 12x (yes, twelve times) less garbage than my neighbour? Is it ethical that I pay $Y for medicare even though I don’t smoke, drink, overeat, or go to the doctor for frivolous things? Is it ethical that I pay $Z in taxes to support millitary conflicts I don’t believe in? Actually, that’s a tough one. Let Joe Consumer pay full price if he’s too lazy or ignorant to shop around. It’s credit and overconsumption driving up prices. Why shouldn’t you get the best deal you can if you’re willing to engage your brain? Of course it’s ethical to buy even if the company doesn’t make money on you. First I suspect assuming the company isn’t making money on you may be incorrect – it’s quite likely they are even at low prices. Secondly you already stated that you only shop at stores that have airmiles – so they have scooped your other business on what may be more profitable items. I do have one objection to your post (or more specifically one point that I’d like to interject). Folks shop at Amazon and chapters to get price breaks – as you’ve noted. I don’t – ever. i shop at my local independent bookstore. Price aside, I think my money is better spent supporting someone who lives and works in my community. Is that worth spending some money on? In my opinion it is. However, my local indie bookstore charges no shipping – ever. And I can return a book without paying shipping costs if it’s defective or if I find I’ve read it before (I’ve had both happen to me). Those two things make my local bookstore cheaper than amazon or chapters. And my local bookstore accumulates a 10% credit on all my purchases that I can redeem on books at any time. Now who’s saving more money? AND my local bookstore owner knows my tastes in books and actively looks for new titles that I will be interested in and stocks them – so that all I have to do is drop in and ask if they have an good books. I get handed two or three titles to choose from, all of which I’m guaranteed to enjoy reading. Put it all together, direct cost, and my time, and the assurance that I’m going to be entertained with my purchase rather than getting a dud book, and shopping at amazon and chapters is going to cost me money. About credit card rewards program. Just keep in mind that in order to accept those cards every retailer will pay a fee (in percentage) that ranges between 1.5% and 2.5% on average (the smaller the retailer, the higher the fee). The more rewards you get, the more expensive it is to accept the card (premium cards like Visa Infinite for example). So the answer on who is paying? The retailer pays for acceptance and passes over the cost to their customers. If you don’t use the rewards, then you pay for everybody else. In the end, the banks and car brands get the most out of it. The company would not offer consumers the option of points and double-points days if they were not making money overall. the only way I could see it being unethical was if you were doing unethical things to gain those points, or berating the cashier/threatening the company into letting you redeem more points than you earned. As you are doing neither of those things, you are certainly playing within the rules. Sticking to your own budgets is not unethical. Remember ‘cost’ price of any given item at a retailer is about half what you pay for it so even if you think you are getting things free you aren’t. To have built up enough points to redeem them for a phone you must have spent plenty in the first place. Retailers love customers having the illusion that they are beating them at their own game, fact is they rarely lose out in any situation – apart from the occasional ‘loss leader’ such as are offered at new store openings to get crowds through the doors. As well, remember that credit card companies get a percentage of every purchase, which they usually give some back to the user as some type of reward (ie. cash back, reward points etc). I’m not exactly sure how it works, but I’m sure that the points are “purchased” by the credit card company, so the retailer really isn’t giving anything away for free. Another consideration is how much time you end up spending tracking your points, looking for bonuses, and comparing the cost/benefit ratio of making your purchases at the point-issuing store. I used to collect Airmiles too until I realized that I spent way more than an hour of time for every $20 in “free” stuff that I received. Now I just buy the lowest priced item that I need using a cashback credit card. I’m sure companies make plenty of profit despite us thrifty people taking advantage of points programs. They probably factor points into their pricing, as well as making more from the customers who don’t use points and who buy things at full price. Frankly I’ve tried to “zen” my points programs. The only big grocery chain I shop at is Sobeys, and here in NB they take AirMiles. I keep my eye open for special deals that save me money AND earn me more points. Just last week I cashed in a year’s worth of points for $100 in grocery coupons. The other “points” I collect aren’t points at all – it’s Canadian Tire Money. I find that the store offers such a broad range of goods that I end up there twice a month and when I do, I get a coupon at the checkout that earns me extra Canadian Tire money when I gas at the CT gas bar (which I always do). I probably earn $50 in CT money a year, which is enough for new BBQ accessories or fun stuff (this year we got a dart board and darts). I think the real question isn’t if using points is ethical – I think it’s about how many pieces of plastic in your wallet is too much, and are you getting any real value from all the points cards/membership cards you have to lug around everywhere? I don’t think twice about who’s paying for the “free” stuff I’m claiming through points because in the end, I had to pay to play. Nothing in life is for “free”, but a lot can be had for cheaper. That’s the way I look at anything I claim using points. It’s simply cheaper then what is on the shelf. Absolutely ethical! They set out rules for the collection and redemption of the points and you follow them. Loyalty programs and credit card rewards let companies track your spending habits — that’s valuable marketing information for them. Should they have to pay for it? I’d argue yes. Companies pay big bucks to research firms — why shouldn’t they reward me for giving them information? That being said, I wonder if the costs for these programs come out of their marketing/advertising budgets? If so, then it could be money that would be spent on commercials or ads anyway. Why not make customers happy? Loyalty programs and credit card rewards let companies track your spending habits — that’s valuable marketing information for them. Should they have to pay for it? I’d argue yes. Companies pay big bucks to research firms — why shouldn’t they reward me for giving them information? I suspect the money comes out of their adversiting/marketing budgets anyway. You sound like a savvy shopper to me, Kathryn, and I don’t see anything unethical about using points and reward systems to maximum benefit. By the way, the name of the magazine is “Chatelaine” – with an e rather than an a.
I’m pretty sure the stores don’t have any ethical issues with all the people who pay more for products or buy stuff they usually wouldn’t buy, paying for it with insured credit cards with 18% interest rates that minimim monthly payments are being made. And since this represents the majority rather than the minority, I think it’s safe to say you’re ok for working it to your advantage. Stores issue points to create brand loyalty. They want you to buy a larger percentage of your commercial purchases with them exclusivly. Over time they will make money off of everyone. The stores also bank on sheer volume. Every customer that does not collect points is subsidizing the point collectors. Not to mention that millions of points go unredeemed. We pay for these points, what about if the credit card companies force the stores in a hidden agreement a 3,4,5% increase in the real price of the products to get the right of having customers paying with credit cards. What we do with the points is just reducing our looses, the stores are happy when you pay cash because they collect all the money for the inflated price, there is not difference in price when you do that. Bottom line, even when you pay the full balance every month, the credit card companies already made their money. From experience with the Aeroplan rewards system I’ve come to surmise that it is in fact the consumer that pays for all the rewards they offer. They are hidden in the cost of the product you purchase. For example, if I find a seat sale or use a discount website to purchase a ticket…. I am not able to collect Aeroplan miles. I found that out after I used a Star Alliance carrier to fly half way around the planet only to find out when I got home that since my ticket was purchased at a discount I would not receive my Aeroplan miles. I too love the rewards programs but don’t be fooled you aren’t beating any system. Is it unethical for every business to try and make absolutely as much money as they can off you, the consumer? Enough said, of course it’s ethical … at least no less ethical than most of the businesses themselves. I haven’t read all the comments yet but I suspect those people have pointed out the rather large holes in your thought process that should ease your conscience. I’d also like to say that the things Kathryn has mentioned here are really only the tip of the iceberg when it comes to maximizing rewards points. I would also argue that there are at times, rare as they are, when a company is definitely losing money on my purchase. I’m not talking overall in the grand scheme of things … I’m talking about when I contrive a purchase to the max with as much stacking as possible. Who pays for it? Those people who pay full price or close to it and might be able to redeem their points once per year if they are lucky. I am fine with that. Rarely a week goes by where I don’t redeem points for something of significant value. I literally redeem points for between $5,000 and $10,000 worth of products and services per year and I’m not exaggerating or joking. Unethical would be to offer a consumer your points program card at the cash register because they forgot theirs or didn’t have one… so many times I have seen that and mentally calculate how much points I would have gained with their purchase! Unethical would be to purchase a product, redeem all of the points you just received and any others for a reward, and then return the product for a full refund allowing you to keep your reward. Unethical would be to have more than one card in your name if their T&C’s forbid it (perhaps helpful during Shoppers ‘Refer A Friend’ promotion as it could allow you to refer yourself). Unethical would be to forge bonus point accumulation or redemption coupons and present them for use. I wouldn’t be surprised if these companies use statistics to analyze, and forecast, people’s purchasing patterns along with points accumulation and redemption. They know some people will be fantastic coupon clippers, only shop on special days or for bonus reward items and use the system legally to the max. (It is like our tax system – you are well within your rights to legally avoid paying as much tax as you can.) On the other hand, there will be people who don’t accumulate points (as mcmatterson pointed out) as it is too much trouble. There are also others who accumulate them but rarely or never redeem them. And you know what happens to those points? They either expire worthlessly or over time the rewards ask for more and more points for the same product or service. Recently we received notice from our electric company that any payment by credit card would be charged a 2.5% surcharge. I switched to debit immediately. Wouldn’t it be more equitable for companies to not use points and reduce their prices for everyone? Would it be fairer to offer cash discounts rather than point incentives? Great points about hidden agreements, hidden costs and brand loyalty. We do pay for those points. Even those of us who use the system to the our best advantage, we still pay. If companies offered discounts for cash purchases, it would save them the hidden bank fees and loyalty program costs and would provide an immediate incentive to the consumer? Many of you touched on the point that companies know what they’re doing and are doing it for a reason. I just can’t help but wonder if there is a better way for both the consumer AND the companies involved. I worked for my family’s retail business for years so I saw the good, the bad and the ugly. Small businesses really do get dinged when people use their credit cards, but you can’t not have them. Debit isn’t free either, and if everyone used cash, you’d be at greater risk for counterfeiting, theft and human error. I guess it’s a no-win situation. In some respect, we’re paying for credit card use and loyalty programs whether we use them or not. I find Shoppers Optimum Program forces me to spend more than I need to. I have difficult accumulating points for Airmiles due to the lack of Airmiles registered vendors in my location. I don’t fly so I don’t have a chance of accumulating Aeroplans. My favorite reward program is the MBNA Smart Cash Mastercard. 3% for groceries and gas. Easy to use and I never need to think about maximizing the points. It helps me to consolidate my regular shopping with my grocery shopping, since 3% cashback is only at supermarkets not Walmart or Zellers. I find using the PC Mastercard for all purchases is the best way to go for a points program. There are no fees, the points add up quickly and can be redeemed for groceries instantly. (Something you can ALWAYS use.) You get even more points if you buy their reusable bags and use them every time you shop. What’s more unethical, you collecting as many points as you can or them charging the $4.99 for the shaving cream? The average shopper is very lazy. They do not look for deals, don’t clip coupons nor wait until prices drop or products come on sale. We live in a society of “have it now” and impulse. Given this, there will ALWAYS be people who pay the minimum balance on their credit cards. This is how MasterCard, VISA, AMEX stay in business – off people’s interest (no pun intended). MasterCard alone reported a net income of >$340 MILLION in Q2 this year. Anyone feel guilty now? Elizabeth: Thanks for sharing your small business perspective. 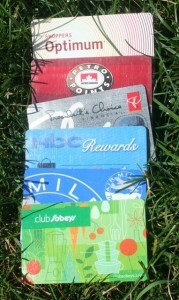 I agree with you that we pay for the loyalty program whether we use them or not .. which is why I continue to use them. Good to hear I’m not alone in redeeming points. There are some great points programs out there! Thanks for sharing your favourites. Some of them have me tempted. I may look into them further. Travel isn’t an issue as we only fly for business related reasons. We tend to drive to our holiday destinations. Hmm. I’m pretty sure this is expressly forbidden in most CC acceptance agreements. Not that companies don’t do it, and get away with it .. but still. If everyone took the time and effort you did, then rewards programs would be worth their weight. Loyalty plan customers pay for the rewards…look at Aeroplan as a classic example. 1. There is a disincentive to redeem points….why cash in 25000 pts for a domestic flight to New York when 75000 will get you a flight to Paris or Shanghai? So you hold onto points for longer….meaning you redeem less often over a lifetime. 2. As a result, you accept paying $50-$100 more per ticket on Air Canada vs. other airlines, always saying “I pay a bit more, but at least I get the points”….the money you would have saved over 5-10 flights would be the same or more than the cost of the “free flight” – with more flexibility, availability and choice of airlines. 3. Even when flights are promised to have “no blackouts”, the only choices you have are the ridiculous 2 stop routes that take 3 times the travel time. 4. Let’s not forget that you’re still paying $175 a ticket in taxes/surcharges when you redeem. In general, the consumer psyche is attracted to “give me free” rather than being disciplined enough to say “I’ll make it free”. Points cards cause a distortion as you are not paying the true cost of a good. If there is a shortage in one sector, it is artificially hidden and the consumer loses touch with the realities. Voting with our dollars is the most important thing we can do in a consumer reality. As well, as has been pointed out, credit cards in particular come out of the retailer’s pocket. If a retailer is making 15% profit on an item, the credit card fee is significant. Therefore the retailer must charge more to everyone. This system just enables those who happen to have premium cards – the rich get richer. Points collectors are gleeful about their 1% points accumulation, when everyone should be saving 2%. Clearly, retailers should be allowed to provide cash discounts. The only points programs that really make sense in the real world is plans like Aeroplan, where the reward fills a seat that would otherwise be empty. There are still goods and services being consumed, but it’s not completely artificial. SA: My experience is that international flights in Canada are generally much cheaper when brought through a broker than so called “discount” websites and big airline website. The last flight that I was looking at was $2200 on Air Canada’s website, while the broker offer $1400 for the same flight with complimentary travel accident insurance. The broker also offered another airline, which is just as good and it costs $1050. I literally save $1150 by going through a broker and no amount of aeroplan points can change that. I highly recommend you check out MNBA Smart Cash Platinum Plus Mastercard review @ http://www.four-pillars.ca/2009/07/17/best-canadian-rewards-credit-card/ . No annual fees and great cash back rewards. No more frustration about redeeming aeroplan points. MNBA Starwood Preferred Mastercard is also very good and I will doing a review on that in the future. I use airmiles and the companies that accept airmiles are by no means ‘small’ in stature. The air miles program is not forced upon the vendor —- they accept it willingly. There are many frugal folks who buy at stores that only offer air miles and often the stores have ‘air miles’ deals where you get more points if you spend a certain amount or buy a certain product. The system must work or else the companies that carry airmiles would trash the whole idea together. I take advantage of the air miles using my credit card (1 mile for 15 bucks) for all my business and personal expenses then I pay off the full balance when I receive my bill. I can usually make about 8000-10000 air miles per year. It’s a nice little perk for a guy like me. I usually pick up a free movie pass or two or a gift certificate for a night out at a restraunt with the woman. The movie pass is a pretty sweet deal. 150 Miles for 2 tickets, 2 pops, 2 popcorns. Nice! That’s like 40-50 bucks right there. Stephen: You’d be great at the interview mentioned above! You should consider contacting her. You have outdone me in many respects! Thanks Kathryn … I just happened to check back on this post and I contacted Zena about it. We’ll see if anything comes of it. We fully expect that if you are chosen you let us know before you appear so we can be glued to the TV! I just saw your article. We live in Poland have a store called Carrefour Express over here. They started a loyalty program using points when you shop. I also can use my cc there where I’m earning points. So, I figure, as long as the prices are decent, I’m getting a double whammy–well, a triple, since the store is usually cheaper than the smaller stores which usually charge regular retail. however, I’ve been debating this in my head as there is another store in the area that sells cheap stuff –sometimes cheaper than the other store. This other store doesn’t have a loyalty program nor does it accept cc. So, I’ve resigned to buying something at the cheaper store and the rest at the store that has a loyalty card and accepts cc. I don’t think you are being unethical at all. If you are living by their rules of redemption and getting them. Who’s paying for the product? It is possible that they are losing money on that product. Maybe they are even losing money on you as a customer. But, there is a saying, “A crowd draws a crowd.” When you park in their parking lot, others see you and they think…”there’s someone there, it must be a good store, etc.” You advertise for them, even if you don’t realize it or even mean to. By your presence, you may influence others to come. Others will not be as savvy of a shopper as you. Thus, you’re fine. Don’t fret. I’ve been redeeming my points at the store. So far I’ve gotten a couple of makeup carriers, a bicycle, a bathroom scale, a clock, an iron, a kitchen scale, and a coffee maker. All of these things were needed when I got them. I usually just let my points pile up until I need something. My son has asked me to get a bike for him when I get enough next time. He’s outgrowing his “little” bike. Over here, I can’t find used like I would in the states, so I probably will do that for him. But as someone pointed out, many thousands, even millions of points go unredeemed. I’d be curious as to the actual ratio of points that go unredeemed to earned each year. We have a whole lot of BP points that are unredeemed. I think we could actually get someone worthwhile from them as well. The problem is, there wasn’t anything we wanted, last time I checked. A pile of BS personally… first use they gave me points after countless attempts to get email verification to work and using it four time after and still seeing no points a teller explains that I have to load my card weekly ??? with crap I don’t want and will only get points if I buy that stuff they tell me to… Really !! What we will see is a rise in cost of products to offset this program and if you don’t play along you will pay more ! !